A mobile photo printer is a device which is used to get instant prints. This product is small in size and can be carried around easily. Mobile photo printers are available in two sizes i.e. pocket and compact. The pocket sized photo printer can be carried in the pocket of trousers and jeans. Mobile photo printers help in getting a photo instantly without the help of a computer or laptop. In the traditional method, after clicking photos from a smartphone, the photos needed to be loaded in the computer; the computer was then connected to a printer to print those photos. Mobile photo printers use Bluetooth, NFC, Wi-Fi, and USB technology to print the photos directly from the device. Some of the factors driving the global mobile photo printer market include increasing demand for advanced tablets and smartphones as well as responsiveness and flexibility offered by mobile devices. Unlike traditional printers, mobile photo printers do not use ink cartridge or ribbon that have to be disposed nor does it produce waste. The device is portable and can be carried around easily, which is an advantage that encourages consumers to use mobile photo printers. Changing lifestyles due to rise in disposable income and quick results have led to the use of mobile photo printers. Rising technological advancements are expected to accelerate the mobile photo printer market across the world. The global mobile photo printer has been segmented on the basis of product type, ink usage, connectivity, application, distribution channel, and geography. Based on product type, the market has been segmented into pocket photo printer and compact photo printer. As compared to compact photo printers, pocket photo printers are expected to hold major share in the overall mobile photo printer market. In terms of ink usage, the market has been classified into ink free and ink based. In ink free mobile photo printer, ZINK (zero ink) technology paper is used to get the print of the photo. ZINK Company has developed a technology through which no ink is required in the photo printer. Ink based mobile photo printers use ink cartridge to print the photo on the paper. Based on connectivity, the market is segmented into Bluetooth, Wi-Fi, and USB. Wi-Fi based mobile photo printers dominate the total market. NFC (Near-field communication) is used along with Wi-Fi and Bluetooth technology to connect the mobile photo printer with the smartphone. Although it is the largest contributor to the global mobile photo printer market, the Wi-Fi connectivity segment is expected to witness slower growth rate as compared to the Bluetooth connectivity segment over the forecast period. On the basis of application, the market has been classified into individual and commercial. The individual segment holds the largest market share. Individuals usually use mobile photo printers during vacation. The market in Asia Pacific is likely to be the most attractive during the forecast period due to the increasing penetration of smartphones and other devices. Manufacturers are keen on entering the Asia Pacific market in order to grab significant share. However, North America and Europe dominated the overall mobile photo printer market due to preference for premium brands among the population. As compared to other regions, the markets in Middle East & Africa and South America are expected to have a slower growth rate during the forecast period. The mobile photo printer market is fragmented due to the presence of several players. Competition is expected to intensify in the coming years due to the entry of several local players. Key companies profiled in the research report include Brother International Corporation, Canon Inc., Eastman Kodak Company, Fujifilm Holdings Corporation, HiTi Digital, Inc., LG Electronics, Sony Corporation, The Hewlett-Packard Company, Seiko Epson Corporation, and Polaroid Corporation. This report on the global mobile photo printer market provides analysis for the period 2016–2027, wherein 2017 is the base year, 2018 is the estimated year, and 2019 to 2027 is the forecast period. Data for 2016 and 2017 has been included as historical information. 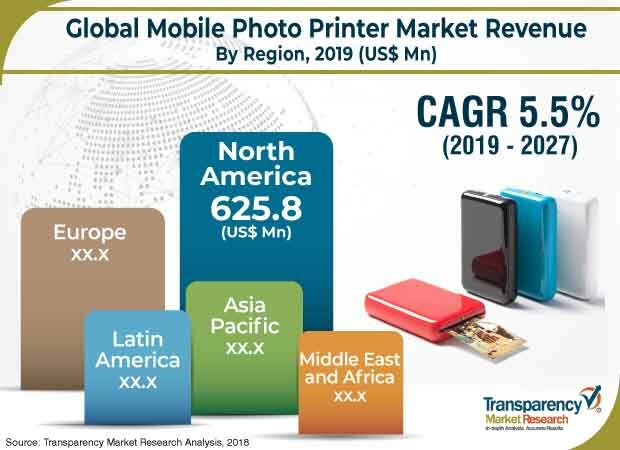 The report covers market dynamics, including drivers, restraints, opportunities, and trends expected to influence the growth of the mobile photo printer market during the said period. The study provides comprehensive analysis on market growth throughout the above mentioned forecast period in terms of value and volume estimates (US$ Mn and Thousand Units) across different geographies. The global mobile photo printer market is projected to expand due to dynamic aspects such as instant print technology and ZINK (Zero ink) technology. However, the market is facing a challenge from substitutes in the market. Nevertheless, investment in research and development to make innovative products is likely to offer attractive opportunities to the market. Increase in tourism has augmented the demand for mobile photo printers. Smudge free print, water resistance, and tear resistance are advantages of using mobile photo printers. The mobile photo printer market has been segmented based on product type, connectivity, ink usage, application, distribution channel, and region. Based on product type, the market has been classified into pocket photo printer and compact photo printer. In terms of connectivity, the market has been categorized into Bluetooth, Wi-Fi, and USB. In terms of ink usage, the market has been categorized into ink free and ink based. Based on application, the market has been classified into individual and commercial. The global mobile photo printer market in terms of distribution channel is categorized into online and offline. Based on region, the report classifies the market into North America, Europe, Asia Pacific (APAC), Middle East & Africa (MEA), and South America. The report highlights key developments in the mobile photo printer market. Porter’s Five Force Analysis, which identifies bargaining power of suppliers, bargaining power of buyers, threat from new entrants, threat from substitutes, and degree of competition is included in the report. Value chain analysis, which shows workflow in the mobile photo printer market and identifies raw material service providers and distribution channels are covered in the report. Segment trends and regional trends are part of the report. It also covers segment-wise comparison matrix, technology development analysis, policy and regulation, incremental opportunity analysis, and market positioning of key players for all regions covered in the scope of the study. The report includes a competition landscape, which covers competition matrix and market share analysis of major players in the global mobile photo printer market based on their 2017 revenues. It also includes profiles of major players. Competition matrix benchmarks leading players based on their capabilities and potential to grow. Factors such as market position, offerings, and R&D focus are attributed to a company’s capabilities. Topline growth, market share, segment growth, infrastructure facilities, and future outlook are attributed to a company’s potential to grow. This section also identifies and includes various recent developments by leading players in the mobile photo printer market. Company profiling includes company overview, major business strategies adopted, and key developments. The companies profiled in the global mobile photo printer market include Brother International Corporation, Canon Inc., Eastman Kodak Company, Fujifilm Holdings Corporation, HiTi Digital, Inc., LG Electronics, Sony Corporation, The Hewlett-Packard Company, Seiko Epson Corporation, and Polaroid Corporation.